So last week I was really feeling festive and I wanted to make something for my hubby, so gingerbread cookies it was. I found this recipe in a magazine (Better Homes and Gardens – 100 Best Cookies, 2010) actually if you want to get technical, it was in a Domino sugar ad, so I thought what the heck! They turned out really yummy, I am not a cookie person, but I do like these fresh from the oven. So give them a try, I bet you will too – enjoy and happy baking! Preheat your oven to 350°F. Line cookie sheets with parchment paper or baking mats. In your stand mixer beat the sugar and butter until fluffy, then add the eggs and honey. In a separate bowl combine the dry ingredients, gradually incorporate into the wet mixture. Scrap out the dough into plastic wrap and refrigerate for 1 hour. 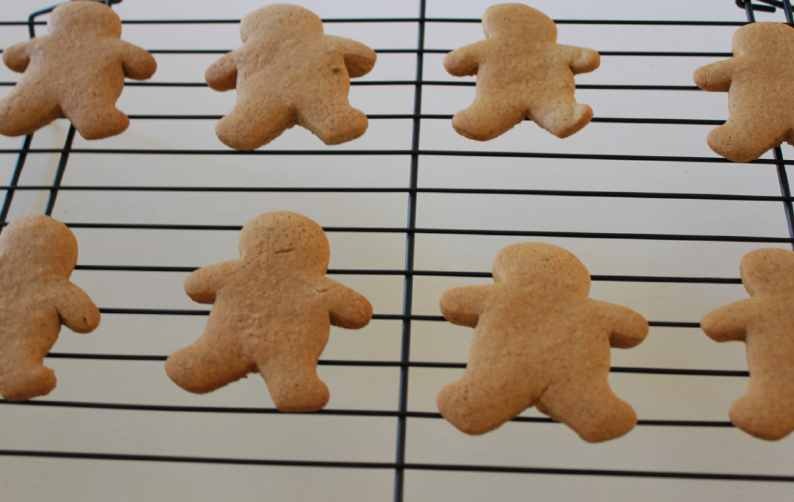 On a well floured surface, roll dough to about an 1/8 inch thick and cut into gingerbread men or whatever shape cutter you have on hand. Place on cookie sheets and bake 9 minutes. Cool on racks and decorate as desired. FYI: Baking time will vary with cookie size (9-12 depending on size). Makes about 3 dozen 3 inch men.